There is a juvenile, three to four year old female dolphin in Pittwater at present who has been around our wharves for at least a few months and seems to like the company of humans. On Friday she was at Palm Beach Ferry wharf. This young lady has also been spotted at Church Point so please keep a lookout when you're on the estuary. Although being monitored by NPWS, who have stated people need to stay at least 300 metres away from this aquatic lovely if in motorised vessels, it is the dolphin herself who is happy to be around people or she is lonely and wishes to communicate with a new family. While talking with Beryl Driver she moved from Palm Beach Ferry Wharf over to what was originally Gow’s Wharf/Palm Beach Jetty, and there stayed hanging around Carl Gonsalves while he worked and then Beryl and one particular rubber dinghy. We were mesmerised for at least a few hours, took at least 400 photographs between us, and Beryl, a dolphin and whale lover for decades who has been trained in their care, kindly related a story she came in contact with a few years ago. 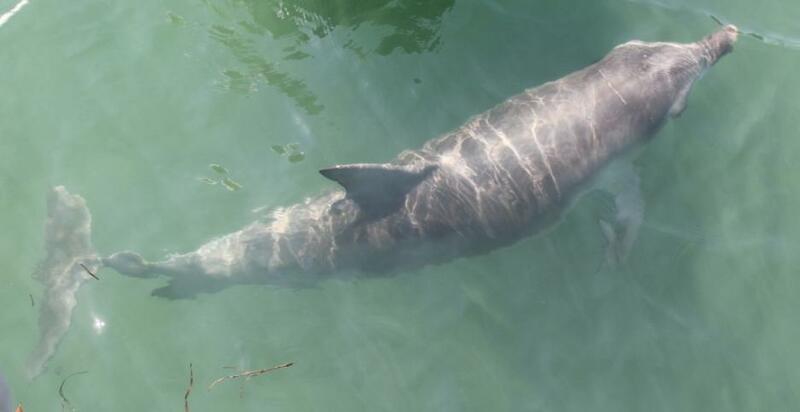 It seems a lady living in Western Australia also had a dolphin visit her daily for years, just this one lady despite others living beside her on the waters edge. The dolphin suddenly went away as the lady grew old and sick and was placed in hospital. On the day she passed away the dolphin came just once more, as though to say goodbye, and never visited the house on the river again. Our fascination with these cetaceans, as they are technically known, goes back centuries. More recent research has determined that each dolphin has its own ‘whistle’ which some state is its name. The series of ‘clicks’ they make is defined as a language which continued research may translate so we are able to communicate with them in their own lingo. The staying around Palm Beach is a Indo-Pacific bottlenose, and not fully grown as yet. Solitary dolphins, or ‘hermit’ dolphins as they are termed elsewhere, are rare but not unknown. NPWS has guidelines for appreciating but not interfering with these wonderful creatures. Refer to list below for regulations and advice. In NSW, dolphins and other marine mammals are protected under the National Parks & Wildlife Service Act 1974. Dolphins are social animals that seek interaction and it is important not to feed them. 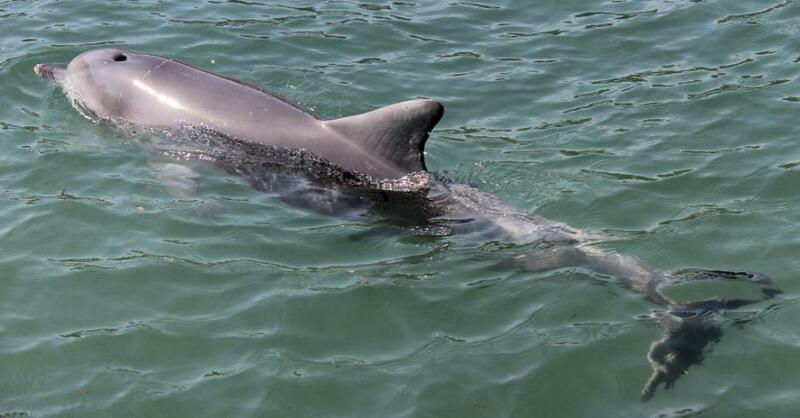 Feeding dolphins exacerbates their sociability and this creates risks for both dolphins and humans as dolphins may become aggressive towards humans and they also may lose the instincts they need to survive in the wild. The NSW National Parks and Wildlife Amendment (Marine Mammals) Regulation 2009 was introduced to protect marine mammals such as whales and dolphins while allowing people to appreciate them at a distance in the wild. Always remember dolphins are wild and unpredictable animals, no matter how appealing they may appear. Keep a safe distance when looking for or watching dolphins and keep children and pets, dogs in particular, well away. Help keep the coastal and marine environment clean. Put any rubbish in the bin so it does not get into our waterways. Report sick or stranded dolphins to the NPWS state duty officer on 9895 7128 or contact the Organisation for the Rescue and Research of Cetaceans in Australia (ORRCA) on 9415 3333. Restrictions relating to approaching dolphins. People should not feed the dolphin and swimmers should not approach closer than 30 metres, as solitary dolphins may at times become aggressive. In a vessel, any approach towards a dolphin closer than 150 metres must be at slow speed. It is an offence to approach closer than 50 metres and any approach should be on a parallel course. Vessels like jet skis that can make fast and erratic movements are of special concern and are not to approach dolphins closer than 300 metres. On the spot fines of $300 apply to anyone disobeying the approach distances and harsher fines may be imposed. 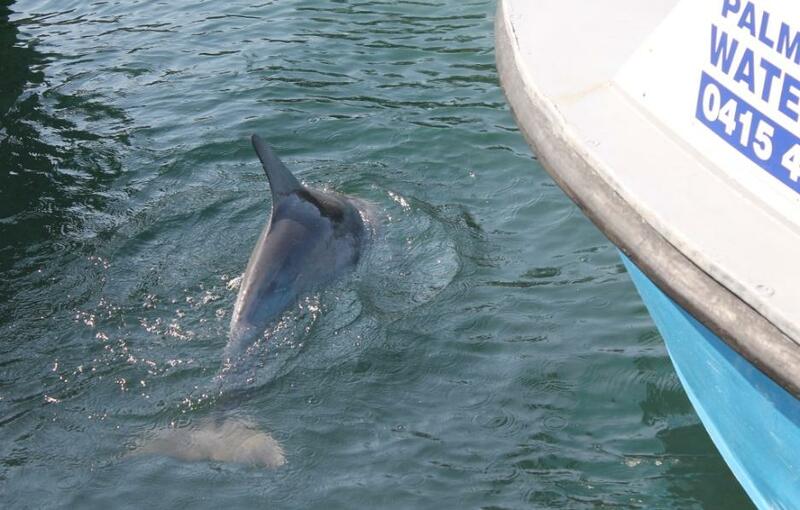 If this or any dolphin approaches your vessel you can either place the engine in neutral and let the animal come to you, slow down and continue on your course, or steer a straight course away from the animal. During the busy holiday period there are boats and other watercraft on Pittwater and members of the local community and NPWS staff are concerned both for public safety and in case this highly sociable dolphin is harmed by watercraft.